Former international Swingman Jean Abdel Nour (198-G/F-83) put on an extraordinary performance in the last round for second-ranked Al Riyadi, receiving a Interperformances Player of the Week award for round 18. The 35-year old player had a double-double of 22 points and 10 rebounds, while his team crushed Sagesse (#9, 1-13) with 16-point margin 104-88. Al Riyadi is placed at 2nd position in Lebanese LBL. They would have been even better if they hadn't lost a few games earlier this season. Al Riyadi will need more victories to improve their 11-3 record. 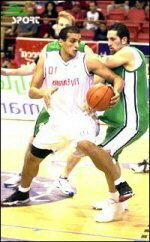 In the team's last game Abdel Nour had a remarkable 80.0% from 2-point range. He has many years of experience at Al Riyadi, through which he has constantly improved. Jean Abdel Nour averages this season 9.3ppg and 8.8rpg. The second best player in last round's games was 26-year old Canadian Keanau Post (211-C/F-92, agency: Slash Sports) of Sagesse. Post had a very good evening with a double-double of 18 points and 12 rebounds. Bad luck as Sagesse lost that game 88-104 to the higher-ranked Al Riyadi (#2, 11-3). Sagesse are still at the very bottom. 13 lost games are too many comparing to just one victory Sagesse managed to get this year. Post is a newcomer at Sagesse, but is already one of team's top players. 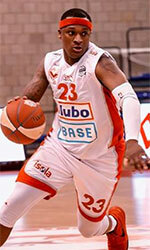 Third on the list of top players last round was another Sagesse's star - American guard Ramel Curry (191-G-80). Curry scored 27 points and passed five assists. Despite Curry's great performance Sagesse lost 88-104 to the higher-ranked Al Riyadi (#2, 11-3). But his team cannot count on just these two top stars as they also need help of the other teammates. Sagesse can only dream about fighting for top spots in the league. They have extremely bad season and 1-13 record places them at the very bottom of the standings. Too bad for Curry he does not play for a better team. But maybe if he did, his season stats would not be that high. Curry has a very solid season. In 5 games in Lebanon he scored 18.4ppg.